Hello ... Hello ... my old friends ... It's great to see you once again! At long last, Jeff Lynne has confirmed in an official Press Release that Jeff Lynne's ELO will indeed be performing with Ed Sheeran at the 57th Grammy Awards in Los Angeles on Sunday 8th February - as revealed by Yours Truly KJS on Sunday 26th January and cited a day later within this ELOBF article. 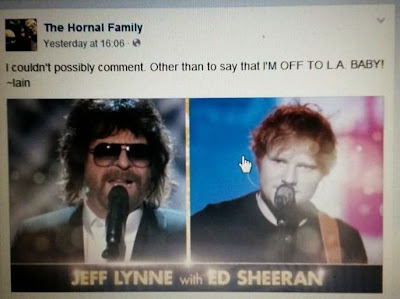 "The latest performers for the 57th Annual GRAMMY Awards® telecast have been announced and include [the] legendary Jeff Lynne's ELO [who are] set to perform with Ed Sheeran ..."
The show will be broadcast in the UK on Monday 9th February from 9:00PM until 11:30PM on 4Music [Sky channel 360; Freeview channel 18; Virgin Media channel 330]. Highlights will follow on Channel 4 [Sky channel 104; Freeview channel 4/8; Virgin Media channel 104] from 11:35PM until 1:05AM and then one  hour later on Channel 4+1 [Sky channel 135; Freeview channel 13; Virgin Media channel 143] from 12:35AM until 2:05AM on Tuesday 10th February. I wouldn't miss this performance for the world, and will be watching with all my Heart and Soul! hope to get my dvd copy from the Uk telly today , so I could watch it over here ....in Spain !! !